MADELEINE McCanns’ parents were seething last night after a top criminologist called for a probe into claims they were swingers. Former police inspector Jose Barra da Costa urged detectives to investigate rumours that the couple indulged in wife-swapping. The university professor, who has assisted in several murder investigations, admitted that the line of inquiry was “dark”. But he said Portuguese police should have checked it out in case it was relevant to their inquiries into the disappearance of Madeleine on May 3, just before her fourth birthday. Paulo Rebelo, the detective in charge of the case, has now vowed to undertake a “root and branch” review of the entire case, wherever it might lead. Da Costa’s comments sparked outrage from Madeleine’s parents Kate and Gerry, both 39. At the weekend, Kate wept in church while hearing priests pray for the “miracle” return of her daughter. The couple’s spokesman Clarence Mitchell said: “This is extremely offensive, deeply hurtful and completely ludicrous. It is not true to suggest they are or ever have been swingers. “It is obviously defamatory and he – and all those who spread rumours like this – had better be aware that our lawyers are watching. Da Costa claimed he had been passed the “swinging” allegations by a former police colleague who was working on the case. Although he had no evidence to back up the allegation, it had circulated on the web. Net gossips said the couple’s home town of Rothley, Leics, was not far from Loughborough – dubbed the “swingers’ capital of Britain”. One newspaper even sent undercover investigators to a swingers’ club in the town to ask if anyone knew the McCanns. But, even though the couple have been named official suspects in the disappearance, detectives have at no point suggested wife-swapping has played any part in their inquiries. Yesterday, da Costa told Portuguese newspaper 24 Hours that police had bungled by refusing to look into the rumours. He said: “I mentioned the swinging matter, because it was what people were speaking about on internet sites and in the coffee shops of Praia da Luz where the McCanns used to go. “That was given as one example of a point in the investigation that should have been cleared up. 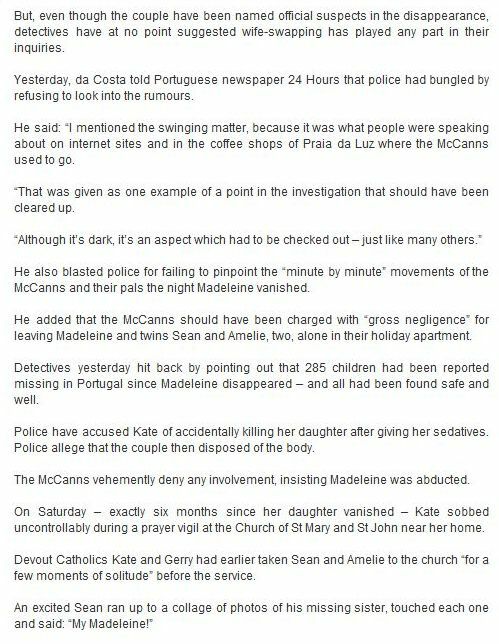 He also blasted police for failing to pinpoint the “minute by minute” movements of the McCanns and their pals the night Madeleine vanished. He added that the McCanns should have been charged with “gross negligence” for leaving Madeleine and twins Sean and Amelie, two, alone in their holiday apartment. Detectives yesterday hit back by pointing out that 285 children had been reported missing in Portugal since Madeleine disappeared – and all had been found safe and well. Police have accused Kate of accidentally killing her daughter after giving her sedatives. Police allege that the couple then disposed of the body. The McCanns vehemently deny any involvement, insisting Madeleine was abducted. On Saturday – exactly six months since her daughter vanished – Kate sobbed uncontrollably during a prayer vigil at the Church of St Mary and St John near her home. Devout Catholics Kate and Gerry had earlier taken Sean and Amelie to the church “for a few moments of solitude” before the service.